Great Blue is a Playtech powered online slot that reels you in with a fun underwater theme and some fantastic opportunities to net some incredible rewards. Featuring 5 reels and 25 paylines, this game is known for being a high variance option, so high rollers take note and low rollers are advised to just keeping swimming. The animations are rich and crystal clear while the splashing sound effects adds an atmospheric experience to your game. If you are a fan of online casinos that take you underwater, then this is the game for you and is available to play for free and real money. Great Blue offers some magnificent opportunities to receive a lucrative payout thanks to various stellar features. Free Spins: This is the main bonus feature in the game and is triggered when you land three or more scatter symbols, represent by a pearl image. Once this feature is triggered, you will receive eight free spins. 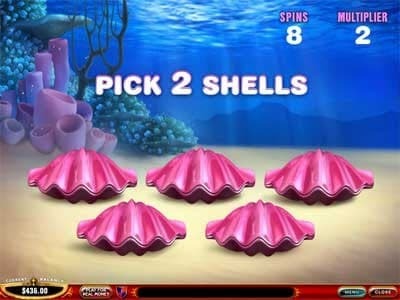 You must now pick up two out of the five shells on the screen for the chance to earn up to 33 free spins and a 15x multiplier. Land three or more scatters as you play and earn even more free spins. This feature can be retriggered. Gamble Feature: If you are in a lucky mood, the gamble feature gives you the chance to double your money. Brave players up for the challenge can click the Gamble button at the bottom of the screen to predict the colour of the downwards facing card to instantly double your money. An incorrect guess means you lose your money and the round is over. Blue Whale Stacked Wild: The wild symbol in the game appears stacked, which means that one, two or three wilds can appear on top of each other. This means that the entire reel is covered, created spectacular winning combinations. If the stacked wilds contribute to a winning combination, you will also earn a 2x multiplier. In terms of online slots, Great Blue is as simple as they come. 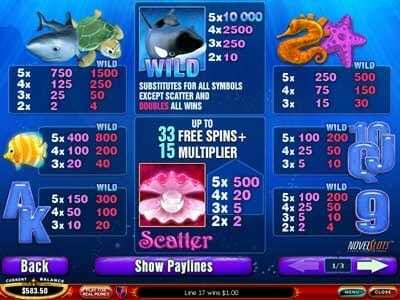 The game features five reels and 25 paylines as well as plenty of underwater-theme symbols that represent both high and low values. The high values symbols include a starfish, seahorse, yellow tropical fish, a turtle and a shark. Playing is easy and requires players to first select your coin size, which ranges from 0.01 to 5.00, making it perfect for a variety of bankrolls. Players looking to win the most profitable reward should aim to bet max on all 25 paylines, although there is the option to adjust your lines as you wish. Players must also choose the number of coins to bet per line, and once you are ready for action you may click 'Spin' to set the reels in motion. Great Blue is a nice, uncomplicated game with plenty of features to keep players entertained and winning for hours. The free spins is a lucrative addition to the game, as well as the stacked wilds, which assist with earning some winning combinations. With a jackpot set at 10000 coins, this game is ideal for both low and high rollers alike.